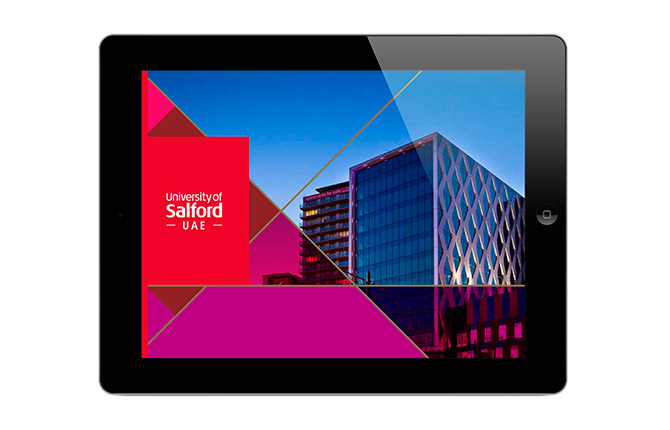 The University of Salford was embarking upon a new initiative to create ‘International Hubs’ termed as such to deliver in-country CPD courses; the first being Abu Dhabi. Truth was briefed to deliver a new site specific identity to support the high-achiever audiences whilst being respectful of the University’s existing brand guidelines. At the same time, we needed to ensure real impact to enable student recruitment in Abu Dhabi. In addition, Truth created a design solution that considered how this might translate to other in-country initiatives for future expansion globally. The new identity has enabled a transfer of the UoS brand equity, whilst allowing the UAE sub-brand to facilitate unique presence in the country across both recruitment and industry events. Blended, in-country and UK flexible study is launching in May 2015. Sub-branding, Print Design, Web Design, Launch Collateral. "The first thing we had to address the challenge of blending the culture of the university and the culture of the UAE people. We didn't want to lose what makes Salford so special."